Inductees, fellow alumni, friends and family at the 2015 Hall of Fame ceremony. It has been a great season of Alumni Hall of Fame inductions thanks to alumni attendees and sponsors. Now AACHS would be honored to have your participation in the premier event of the 2018 Hall of Fame ceremonies: the Oct. 17 dinner celebration honoring the living, non-faculty inductees. Marc Brickman, 229, is a world-renowned lighting and production designer and Emmy winner who has worked with Bruce Springsteen, Barbra Streisand, Paul McCartney and Pink Floyd. He has created light shows for opening and closing ceremonies at the international Olympics in Barcelona, Spain and Nagano, Japan. Marvin Corman, 208, M.D., is the author of the gold standard textbook “Corman’s Colon and Rectal Surgery,” past president of the American Board of Colon and Rectal Surgery and professor of surgery, Stony Brook School of Medicine. Lee Felsenstein, 219, developed the first mass-produced portable computer, the “Penny-Whistle” modem and a visual display module board that became the standard for PCs. He is a laureate of the Tech Museum of Innovation. Albert Fishlow, 199, PhD., is economics professor emeritus, Columbia University. He has served as consultant to the World Bank, Ford and Rockefeller foundations and has been the editor of numerous economics books and monographs. Philip Freelon, 230, is an architect who led the design team for the Smithsonian National Museum of African American History and Culture. He was appointed by President Obama to the U.S. Commission of Fine Arts in 2011. Neal Kassell, 221, M.D., is professor emeritus in neurosurgery at the University of Virginia, and is a pioneer in the development of high intensity-focused ultrasound for the treatment of intracranial diseases and cancer. He was named to Vice President Joe Biden’s “Cancer Moonshot Initiative” in 2014. Herman Rush, 187, is an entertainment-industry executive and former chairman of Columbia Pictures Television and the Coca-Cola Telecommunications Company. He is currently creating TV and cable programs for the internet and other media. David Soll, 213, PhD, is a microbiologist and professor of biology at the University of Iowa. He is renowned for his studies of yeasts (Candida Albicans), innovations in monoclonal antibody technology and research in DNA fingerprinting and cancer stem cell markers. As we mark 79 years of Dear Old High’s establishment at its Ogontz and Olney avenues location, the cost for the evening will be $79. Alumni are also asked to sponsor a student to attend the affair. This gives students not only the opportunity to meet the honorees, but allows them to dream about attaining their own place in the Hall. Register online for the Hall of Fame evening. Thank you and hope to see you, fellow Lancer! 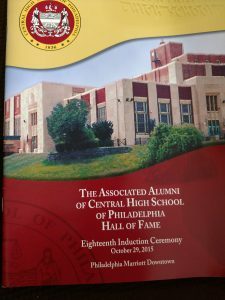 Read about the induction ceremony at Central earlier this year for retired alumni faculty members here. ← Is That a Lancer in That Car Up Ahead?